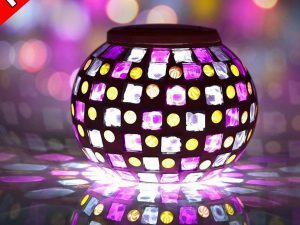 - Solar powered outdoor table lamp,100% brand new, made of high quality mosaic crystal glass and high efficient solar panel. - Automated switch - Auto on at night / auto off at daylight, sensitive to the light, can continuously work for 8 hours if it is fully charged, no wiring or any installation,very convenient to use. - 2 Modes: single mode and color-changing (RGB) about this solar indoor/outdoor night lamp, creat a romantic and wonderful atmosphere. - Waterproof/weatherproof,performs well even it is in the rainy days,ideal for home,indoor and outdoor decoration. Please charge it under the sunshine for some time before the first time use for best performance,since maybe because the power of built-in battery ran out. - Solar powered outdoor lights, Color changing, Energy-saving,creates a romantic and lovely accent, ideal for home,patio garden tables and indoor/outdoor decorations,also a best gift for your family member,friends,your parent and so on.